Чтобы не использовать Легкое перышко для заклинание, можно поставить символ Обугленный символ, в это случае заклинание можно использовать без Легкое перышко. Заходим на арати на лесопилку, накладываем на себя, садимся на маунта, разгоняемся и прыгаем в сторону кузни - ПРОФИТ. Although this spell doesn't get as much use as your other mage spells, getting the light feather reagent isn't terribly difficult. There's a great spot around Moonbrook in Westfall where you can get Light Feathers without much problems. If you go behind the town hall type building, there will be a cemetary with a lot of buzzards. They respawn fast and drop a good amount of feathers. You can also run around the immediate area to get nearby buzzards...overall, a level 60 mage should be able to get 20 in an hour at the most. I agree with Chandrialla, this spell has got me out of one or two situations where I have accidentally walked to close to an edge. :D For lower level mages, the various Foreststriders in Darkshore are great for dropping Light Feathers too. I always save Light Feathers till I have around 30, then sell a bunch of 20 in the action house for a bit of extra income. If you want to save feathers, you can also try blinking just before you hit the ground. However, this means you need a computer which isn't lagging, and if you do it wrong you have fatal/embarrassing results. It is actually harder than it seems, because you appear to be closer to the ground than you actually are. If you don't mind using feathers, Slow Fall is the way to go, and is a very useful spell, such as jumping off from Lumber Mill in AB when things get tricky. As bangy mentioned, jumping off the Lumber Mill in AB is great. If you happened to be mounted as well and get a running start, you should be able to make it to the Blacksmith. Neat little trick to assault the middle island from above. Slow fall also helps in high level instances where you can get punted up into the air (AQ40 trash, Anub in naxx) and in boss fights such as Gluth in Naxxramas where you have to jump down or Thaddius where some people miss the jump from the mini-boss platform to Thaddius's platform. Priest's version of slow fall does not work while mounted, mage's does. If you are a mage in AB and you don't use slow fall, you are missing out on the fun. But watch out - shamans/priests have sometimes purged my slowfall in midair. You cant polymorph somone on a flying mount, the mount makes them immune. Barrens plainstrides have a pretty good light feather drop rate. Blink makes this obsolete because once you get near the ground, blink and you avoid all fall damage. You have to get it right. I use slowfall while I'm on my mount in Arathi Basin when I'm at Lumber Mill, once Blacksmith is attacked. Slowfall, Mount up, and fly ! My personal favorite is floating down into the mine raining fire blasts down upon my enemies. For those level 63+ who don't want to go back to Westfall, the arakkoa in Terokkar drop feathers extremely often, as well as money and Netherweave. Probably a more profitable place to farm feathers than low level zones. 1. Start at a place with a cliff, such as the Lumber Mill. 2. Make sure there are plenty of targets below. Feel free to mix up what spells you use, using instant casts + PoM + Cast Time Spells are good too. This spell is only for TBC. u can sheeped in the air. and that stops the fall like u floating in the air untill sheep weres off. You can recast this in midair to prevent a splat. 2 ICE BLOCK! Cool way to get no falling damage. but funny to c from below! Now can be cast on friendly players, yihaaa! now in the 3.0.8 slow fall becomes castable on others. That's awesome I'm out of my mind that with the glyph it becomes a raid thing that may save lives and lives to people. This allows for some smarter and easier Slow Falling. If the target is on your side (help) and it isn't dead (nodead), it'll cast Slow Fall on them. If the target is hostile or the target is dead, it will cast Slow Fall on yourself. This can also be done with Arcane Intellect and other buffs. Fun change. Lots of mages will be seen falling fast instead of slow after failing to cast it on themselves, because they are still targeting another friendly player. Hence this macro.The standard spell button is to be put on a side-bar for use when buffing other people. The macro button goes on the main bar, for use in case of emergency. It's helpful to remember that if you blink whilst slow falling, you stay in one place and float gently downwards, which is nice for avoiding overshoots. This was incredibly uncool. Didnt realise they changed it, and hadnt played my mage in a while. Clicked Slow Fall like normal, and got a blue outlined hand, some "wtf?" and death. So remember to F1 before you jump! With the glyph, this spell becomes very cheap alternative for dispel protection (other than spamming 1st rank of Mana Shield). Might save your PoM or Ice Barrier! Anyways, best results when combined with Rocket Boots Xtreme (Lite). Can get you to many interesting* places. 1) Fall speed drastically increases after removing Slow Fall. Wowwiki says this is about meeting maximum velocity much faster than normal. I dunno, but it's nearly killed me before. Basically, when you lose Slow Fall in any way, you will drop noticeably faster than normal. You can use it to your advantage from great heights; slow fall, then instantly remove it.. it's a quicker trip to the ground. Recast when you've almost landed, or just cast Blink or Ice Block. This won't always work.. but this has worked for me many times. Try this: Slow fall yourself, mount up, and jump off somewhere really high. Get off your mount. When you're at a height that seems like *just* enough to kill you if you fell, try Blinking. You may be surprised to Blink safely on the ground! This obviously doesn't work from too far up. You'll blink and go nowhere midair if it fails. However I've done this many times from a height clearly not Blinkable to the ground under normal circumstances. It's a bug, but a fun one. where i get one of that in dun morogh? Slowfalling from LM to BS, like a boss! Jumping off of really tall things while mounted to see how far you float! Not having to pray to various gods that server lag will cause you to blink upwards 40 feet and refall to your death! Saving yourself from fall damage in encounters, such as Archimonde and Malygos! No more grunting in pain like the unwashed masses for YOU! Own a bird other than a phoenix! Free up an inventory space! But most importantly, have fun! Seriously, what the hell else are you going to use those 3 Minor Glyph slots for? Penguin polymorph? All the cool kids use Pig! Or Turtle. Or... something other than Penguin. Point is, you've hit level 15, and this is your reward! Non-mages, note the duration and range of this spell. 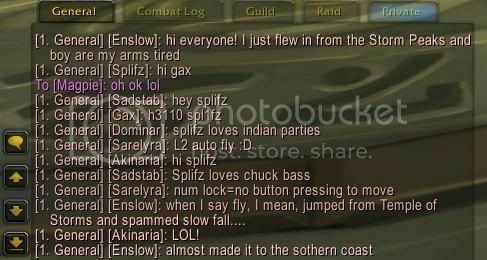 After helping a buddy with *Last Rites in Borean Tundra, we were joking about me getting him cold weather flying. I cast Slow Fall on both of us, "There's your cold weather flying. Let's jump!" I step off, he mounts and makes a flying leap off the platform, enjoying himself quite a bit. We're traveling forward at very different rates, and it's a long ways to the ground. About half way down, he realizes this is going to be a problem. "oh no, it's wearing off, no no no no!" Dead. I renew my Slow Fall, laugh, and wait for him to come back from the graveyard. Lesson: Sometimes it takes longer than 30 seconds to slow fall to the ground. If you are more than 30 yards away from your mage mid-fall, you may be in trouble. *Background information: this quest takes place on a floating platform. Players without flight are teleported to and from. That's not a bug. Your fall speed returns to what it would have been had you not cast the spell. Actually, we aren't talking about the velocity of the fall, we're talking about the acceleration of the fall to reach its maximum velocity (roughly 10ft/s/s -> 60ft/s/s). Velocity is the speed you are traveling at (e.g. 60ft per/sec). Acceleration is how fast it takes you to reach a particular speed (e.g. if it takes 2 seconds to go from 0ft/s to 60ft/s then you accelerate at 30ft/s/s (yes the ft/s/s is intentional as its the velocity increased per second)). So it is untrue that one player will fall faster. One may temporarily 'fall faster' only to fall at the same rate as the normal falling speed. Mage was mounted demount himself slow falled and I swooped down and he was able to remount mid-air.. If you fall off the lowest platforms in the Oculus or Firelands, you'll die even with this spell. According to vids such as this one, this also happens if you manage to jump off the edge of the world, so I suspect that reaching the lower world limit is always fatal everywhere, and that these two instances just happen to be the only places where it was intentionally made possible. I first used this to slowfall off Teldrassil. Made it all the way to Darkshore, then realized I didn't take any screen shots. So I ported back and tried again. My longest ever fall was over 3 minutes long. So yes, pay very close attention to how much time is left on that buff and how far you are from a mage. I just noticed that Slow Fall allows you to jump a lot farther using the thermal vents in Molten front. Insted of having a parabolic curve for the second half of the leap, you are falling down in an oblique line. Any spell that can be cast while moving, Instant casts such as or Огненная глыба procs, and spells that can be cast while moving such as Ожог with , can be cast while you are using Замедленное падение. A good use of this is an aerial assault of Blacksmith by jumping off of Lumber Mill in Низина Арати. It's possible to Ожог Ожог Ожог until you get a proc and kill someone before they know where you are coming from or hit the ground. Also can be useful for dismounting players on flying mounts, fly in the same direction as they are flying, about 40 yards above them, at (hopefully) the same speed and cast slowfall and you'll continue in the same direction as them at the flying speed you were at before. Hopefully you can do enough damage to dismount them and laugh as they fall. An odd and seemingly unaddressed bug I've noticed is if you log on to your mage that happened to have been logged out of while on a flying mount and with slow fall cast, your movement speed will be roughly half what it should be until the slow fall buff wears off or you dismount. Has anyone had it suddenly drop before the timer runs out? Just happened to me for the third time so I was paying attention. It dropped me with 17s to go. Im not 100% sure what has happened, but I have tried using this spell everyday for fun and I got some places Ive tested exactly how far it goes, and for some reason it looks like it goes slightly further now, even if just by a couple of feet...Noticed this when applying it to myself and jumping forward, usually I wouldnt be affected by just jumping, but now I am hovering a couple feet forward. Changelog doesnt mention anything regarding this, some other change that may have affected it? В течение 30 sec. снижает скорость падения участника группы.